92% utilization From their results. The difference between quality promoters and usual one. Company has to pay interest on some FCCB during last quarter so the EBITDA margins were hit. Again we did not forced promoter to give this guidance, can’t you refer it before giving guidance. EBITDA by definition is earning before interest, tax and depreciation/ amortization. How can interest outgo affact operating margins. Entitlement ratio 8 shares in PIL will get 1 share in Prakash Pipes. Can anyone calculate the Valuation of Prakash pipes based on the Entitlement Ratio. Looking at the recent price action…does it mean that market is assuming the current earnings are its peak earning and only way is to go down? Generally i dont look at price action …but in commodites it might make sense to verify the thesis with price action. In my opinion it would be too early and premature to say that the Steel Industry in India has peaked out. I am trying to figure out the total outstanding liability against the outstanding FCCB to calculate further equity dilution in case of conversion but not able to reconcile. Please advise if any body has calculated the outstanding FCCB liability as on 31/03/2018 and probable dilution. correct. that is indeed the case. since most of power is captive consumption both should be seen in conjunction. I think we should discount FY22 projections. And in cyclicals we should never think that long. If cycle stays in uptrend, we keep on holding. Few points to be noted is that with the start of mines, their margins can improve. 1st mine can open in this quarter. Also, value unlocking through demerger of PVC division is going to happen, though it is taking a lot more time than envisaged. I dont know how much of their first mine will serve their Iron ore needs. But if their complete need of 2.5 million tonnes is done by their mines then they can do 100-150 crs of profits from their mining business (when both the mines starts). This is on assumption that if NMDC can do 1500 per tonne (efficiently run without any debt) then they could do 500 at the least. I have not considered the debts taken for mining division (that should be deducted from the profits). The Orissa Iron ore mine is comparatively a small mine with total capacity of around 5 to 7 MT with annual capacity of around .75 MT. However the Iron ore mine at Chhattisgarh which is likely to be commissioned within 1-2 year is comparitively a bigger mine, which will full fill its entire requirement. 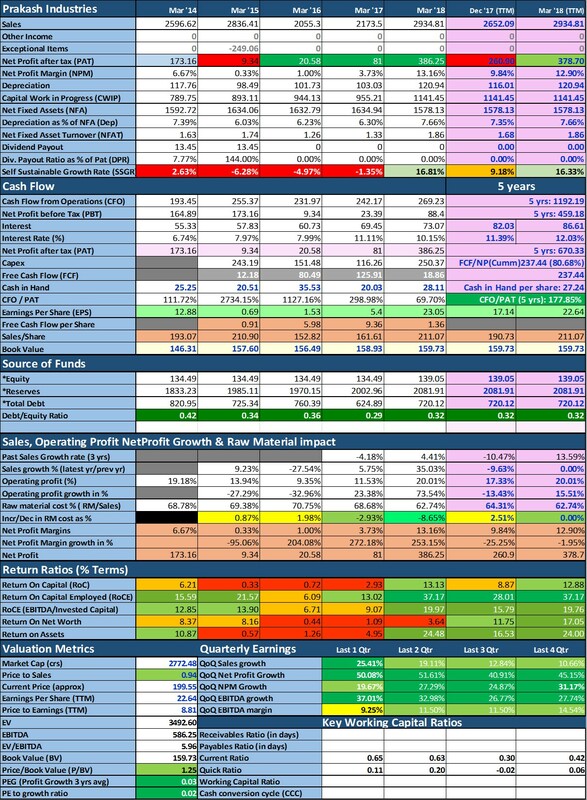 Here is a company snapshot on various parameters. The SGR (Sustainable growth rate refer this http://www.drvijaymalik.com/2015/06/self-sustainable-growth-rate-measure-of.html) has improved thus capable of working efficiently has improved. The company is very efficient in managing its working capital cycle. Although the sales has grown by 25% the company has not compromised with its receivables and managed to keep it at the same level in days terms. The receivables /Debtor days is at less then 12 days which as per my analysis is one of the lowest. Further the 25% or 600 Cr increase in sales has been managed by the company with additional working capital of Rs 43 Cr which is very efficient . @jitenp I would like to know about your views on the Indian Steel Industry for next 2 to 3 years and growth opportunities for companies like Prakash Industries. 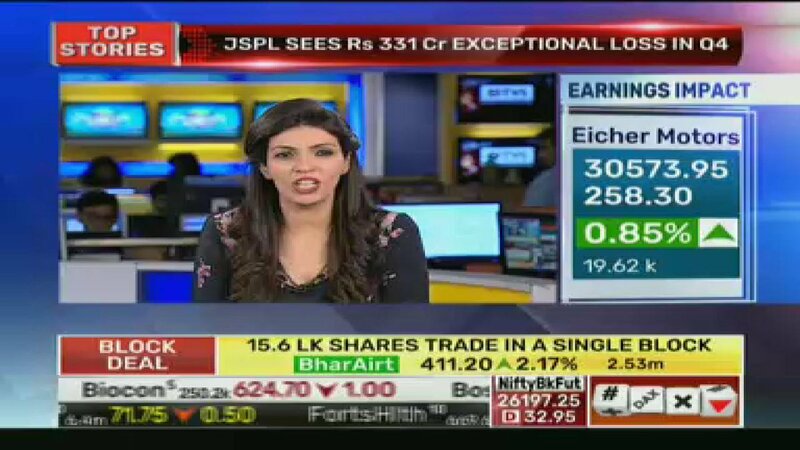 ICRA steel industry outlook partial report predicting further EBIDTA margin improvement. prakash industries demerger approved by all stakeholders.